BEFORE we get to the heart of the matter – so sorry to be the bearer of continuous bad news – it is imperative to set the stage, one which will shed some light onto how far down the rabbit hole the FBI (under HUSSEIN Obama’s DHS umbrella) has fallen. Alice-in-Wonderland like. DEDICATED readers may recall a May 2015 commentary, “Islamic Money/Gold Laundering In Massachusetts Finances Jihad: Feds Ignore Evidence”, as it documented a bird’s eye view into the FED’s malfeasance. You can’t make this stuff up. IT is becoming increasing difficult to play deaf, dumb and blind to the unremitting Islamic terror throughout the west, never mind the rest of the world. And if anything brings this truth into laser sharp focus, let’s just view ISIS’s attack in Garland, Texas as a ‘new’ opening shot to jihad, regardless of all the preceding attacks. BE that as it may, talking heads, leftist apologists and Islam’s mouthpieces – with CAIR in the forefront – prefer to blame Pamela Geller and associates for any ensuing carnage by Islamic jihadists. You got that? In other words, as long as Americans give up their Constitutional First Amendment right, well, Islam’s soldiers will be appeased – for now. Alas, if Shariah Law’s Blasphemy dictate is the price to pay, so be it…..
TO comprehend the essence of the case being presented, it is intrinsic to possess a basic level of knowledge, relative to the overall connection between money laundering and terrorism. Specifically, it deals with gold laundering and its conversion into monies F/B/O jihad. Pay heed. LET’S start with the case’s foundation, even though particular names – at this juncture – will be omitted. First things first. IN this regard, though the cesspool of the Mid East seems a world apart from ‘any city’ USA, the fact of the matter is that its tentacles are less than six degrees separated. Believe it. INHERENTLY, this discussion leads back to the oft mentioned ‘sleeper cells.’ They may comprise students on visas, so-called ‘refugees’ entering under humanitarian status or legal immigrants etc. Regardless, their goals are to assist their brethren back home to wage jihad, either from abroad or within their respective western countries…. THE ‘persons of interest’, now living in Massachusetts, are Sunni Muslims from a very large clan spread throughout Lebanon. While this part of the Mid East is most well-known for its Shia/Hezbollah/Tehran axis – over 54% of Lebanese are Muslim – approximately 27% are Sunni. IT is into this vortex that money/gold laundering comes into the picture. So what’s the upshot? AN entire jihadi clan operates as successful retail entrepreneurs, owning stores ‘related’ to this particular type of operation. Even more so, they have a distinct presence within community-based organizations and clubs, just like many successful retailers. Hiding in plain sight. Hmm. MOREOVER, they also own several homes in the general vicinity. Basically, they are deeply involved in buying a lot of stolen gold with cash from their ‘related’ businesses. In general, retail businesses (in the hands of white-collar criminals or terror financiers) can accumulate stashes of unreported cash for this and that. One main mechanism is through the under-reporting of sales, whereby receipts barely reflect the actual income generated, thus, sales tax and other mandatory taxes are negligible. Use your imaginations. MOVING right along, once they horde the gold it has to be melted into proper form. As a result, one of their (Massachusetts) homes is used as a base of operations, the end result being gold bars approximately 10×1 in size…. MOST significantly, an informant (vetted by an impeccably credentialed counter-terror contact) handed over very detailed information (which cannot be posted for various reasons) with NAMES, ADDRESSES, TRAVEL plans etc to relevant FED agencies. THESE agencies include the FBI, the Attorney General’s Office in Massachusetts and the IRS. They all refused to investigate said charges. Why? CONCLUSIVELY, the following response (going back to Aug. 2011) to said (courageous) informant should serve as prima facie evidence (Exhibit One), attesting to the FEDS utter refusal to even look into the charges, which more than met the criteria for immediate investigation. THE point being, due to the fact that intel – one way or another – falls into this investigative journalist’s lap, when certain charges are made they are hardly theoretical or offered by a ‘talking head.’ In fact, the FEDS (from the FBI, AG, and the IRS, having had contact with some of its agents) are as interested in bringing Islamic terrorists to heel, as American patriots are in bowing down to Allah. Never gonna happen. IT is into this cauldron of fire that former Marine Jon Ritzheimer entered the fray and found himself spotlighted at this site. For good reason. AS the latest target of Allah’s Muslim terrorists, be they ISIS or another of the Brotherhood Mafia’s hydra axis, they won’t allow freedom to remain a part of the American landscape. Oh, really? ALAS, what has them all riled up and pointed in his direction, or do we even need to ask? Apparently, his “crime” is adhering to his Constitutional right, to both protest in front of the terror mosque which schooled Pamela Geller’s shooters, as well as alert the public about what is at stake. Intrinsically, his message boils down to this: if Americans fail to stand up to those whose absolute intention is to take away said freedoms, rest assured, Allah’s soldiers will turn America into an Islamic adherent nation. It is that clear. That stark. IN this regard, CAIR, a HOT topic at these pages, is taking up too much time and space. Sigh…there is no other option. 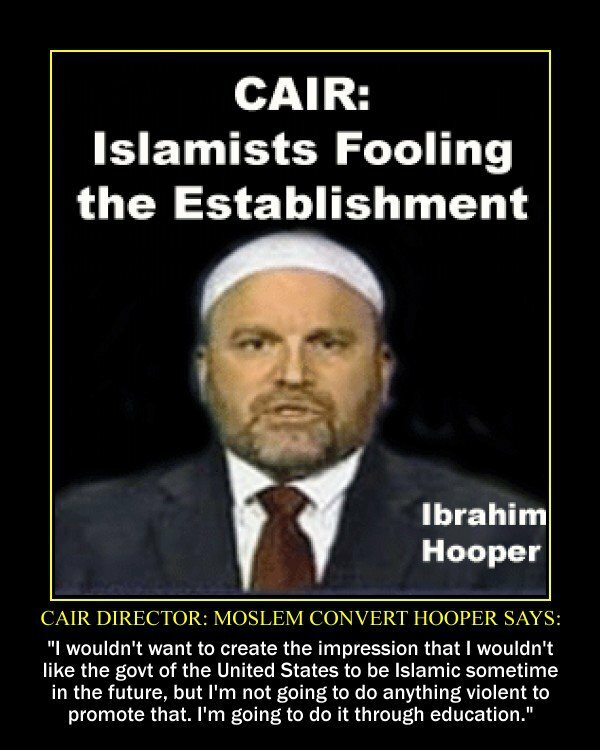 And like the committed ISLAMIST that he is, CAIR’s Director, Ibrahim ‘Dougie’…Shmoogie…Hooper, has a set of brass balls, pardon the descriptor. Shmoogie, how dare you? Chutzpah galore. As the major (communications) mouthpiece for the Brotherhood’s terror Mafia, his main mission is (among other supportive acts of jihad) to squelch ALL criticism of Islam, come what may. ON cue, here CAIR blows again, yet, HUSSEIN Obama’s CAPTURED media is duly obliging, even though CAIR is an Unindicted Co-conspirator to the Holy Land Foundation Trial, the largest terror trial in US history! The prominent Muslim civil liberties organization, the Council on American and Islamic Relations, has been keeping tabs on Islamophobia throughout the country for decades. But in the last few months, leaders tell New Times, it’s maintained an extra-close eye on Jon Ritzheimer, the local ex-Marine and face of the anti-Islam crusade in Arizona. But after we published the story, we learned that Ritzheimer had in fact posted another video the previous day called “the real reason for the Chattanooga shootings!” It’s unclear why, but within hours of putting it up, Ritzheimer deleted it from Facebook. He did not, however, remove it from YouTube, where it has 352 views. In this video, Ritzheimer strays from his usual filming-while-driving video, and instead takes the camera out to the desert so he can film himself shooting a Quran with an automatic weapon and then later a handgun. “I’ve been watching the news and they’re saying FBI is still investigating – they’re trying to find a motive for the gunman out in Chattanooga. They’re still digging and investigating and still really trying to find the motive. So I’m out here, just searching around out here in the desert, hoping maybe I can find the motive,” Ritzheimer says, putting his hand above his eyes to block the sun and surveying the land around him. “Maybe, you know, we can do this like Blue’s Clues, and we’ll look for the motive and stuff. Oh I don’t know,” he pauses, slowing lifting a Quran into view. He then proceeds to place the Quran against a shrub and fire at it with an automatic weapon and then a handgun. The challenge, both Hooper and Yousuf say, is that unless Ritzheimer (or any of his supporters) makes a direct and specific threat, his actions and comments are protected under the Constitution. We understand that “law enforcement’s hands are tied, even though its hateful speech,” Yousuf explains. “He has the freedom to say it, but we’re worried that he, or one of his Facebook followers, is going to go out and do something.” Just look at the comments under the videos he posts online, he says. Yousuf finds the rhetoric terrifying, saying he and others take screenshots of the comments regularly and send them to law enforcement. CAIR’s work with law enforcement isn’t something new. As is stated on the group’s website, “like the rest of the mainstream American Muslim community, CAIR believes it is both our civic and religious duty to work with law enforcement to protect our nation. Even one incident of violent extremism is too many.” CAIR regularly condemns acts of domestic and international violence. Also, “the number of murders done by Muslims is infinitesimal compared to the number of [people] murdered by firearms every year,” Hooper says, citing a recent study conducted by University of California professor Travis L. Dixon that found 81 percent of the media’s reporting on domestic terrorism concerns a Muslim perpetrators, while in reality, Muslims only account for 6 percent of the total number of suspects. IT is under HUSSEIN Obama’s Islamist wings that CAIR’s strength (the entire Brotherhood Mafia) has taken over the nation’s agencies. Again, BOO HOO Hooper and gang of Islamic barbarians….yes, we are watching you too!! And to Jon….you know where this site and its millions of readers stand. DESPITE it all, the precipitous dangers will not allow patriots (and others who prefer to stand on the sidelines) to pretend that what is isn’t, all in order to find (false) comfort in what was once a given; the reliance on national security agencies for safety and law and order. AGAIN, as proven throughout this site, the nexus between the FEDS and Islamic entities is inextricable. Akin to pigs to their sh-t. Prying them loose has a snowball’s chance in hell. THUS, each able-bodied (of majority age) male and female must rally around those who are placing themselves in the cross hairs and the firing line. It is unthinkable that they should be left to hang out to dry, so to speak. SO reaching out to the likes of Jon Ritzheimer (as one example) is not only in every patriot’s best interest, but it is morally incumbent to do so. MIND you, anyone who has spent time around these guys knows that they don’t talk smack. In other words, if you cross certain lines there will be no going back – literally. That is, unless the person doesn’t mind returning home to their pagan Allah. Islamists must internalize that this band of brothers (once they return to civilian life) are often the ones who lead the charge. As such, Allah’s barbarians within America would do well to realize that they are playing with fire, even though they enjoy Federal protection. 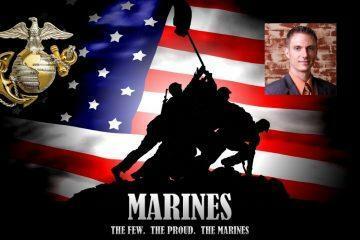 IN a nutshell, Jon’s fellow warriors (ex vets and others of like mind) are more than pissed off. Trust this: they are livid!! Well armed. This site is in constant touch with more than a few and they are deadly serious. MOST significantly, they don’t give a rat’s behind about what the FEDS order them to do…to ‘stand down’…they have no intention of complying. The Pentagon asked that concerned armed citizens not stand guard at military recruiting offices, saying it can handle security on its own after a shooting rampage. IN reality, they are no longer under the Pentagon’s boot, and all sides know this. Muslims in America….you are FOREWARNED! This entry was posted in Uncategorized and tagged "Islamic Money/Gold Laundering In Massachusetts Finances Jihad: Feds Ignore Evidence", Allah’s Muslim terrorists, Brotherhood's terror Mafia, CAIR's Director, Council on American and Islamic Relations keeping tabs on patriots, FBI's rabbit hole, global Brotherhood Mafia, http://islamexposedonline.com/2015/07/27/fbi-monitoring-patriots-cair-reporting-to-islams-captured-agency/, http://joeforamerica.com/2015/07/fbi-monitoring-patriots-cair-reporting-islams-captured-agency/, http://paper.li/f-1376058087?edition_id=1d8b4940-34e9-11e5-9be7-002590a5ba2d&utm_campaign=paper_sub&utm_medium=email&utm_source=subscription by Adina Kutnicki. Bookmark the permalink. 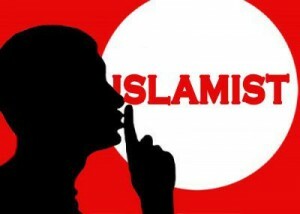 Pingback: Israel's Voice | FBI Monitoring Patriot(s): CAIR Reporting To Islam’s Captured Agency! Pingback: Israel's Voice | DHS/FBI’s ‘Double Game’, Issues Warning: Beware, ‘Mid East Males’ Threatening Military Families. Yet, FEDS Literally Disarming Them. Sitting Ducks. What Are They Up To? Pingback: Israel's Voice | American Patriots Invoke Treason Statute: Lawmakers, Who Voted For Iran Nuke Deal, May Be Arrested. Pingback: Israel's Voice | US Patriots (Finally) In An Uproar: Islam’s Encroachment In Their Cross Hairs. Brotherhood Mafia Apologists Fired Up.